Located between the beach towns of Nosara and Samara (and approximately six miles from well known beach of Playa Guiones) is the quaint little fishing village of Playa Garza. Plaza Garza can be best described as a white sand oasis off the beaten track. Considered the least touristy of all of the beaches between Samara and Nosara, Playa Garza is the perfect getaway from the hustle bustle of commercialism and tourism. In fact, Garza has the endearing reputation of being a village that has more cows than people. Boats are anchored off the shores ready for local fisherman to whisk you away to sea, to help you catch your own lunch, and to allow you to enjoy an incredible experience floating in the blue waters of the Gold Coast’s Pacific Ocean. 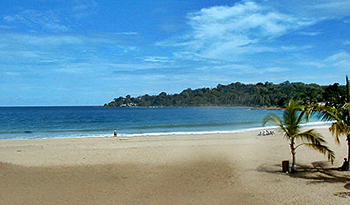 Playa Barco Quebrado is located just south of Playa Garza and consists of beautiful white/light gray sand beaches. Both Playa Garza and Playa Barco Quebrado offer prime real estate between the beach of Nosara and Samara, and without the Nosara and Samara real estate price tag. For those looking for affordable alternatives to live in or invest in Costa Rica’s Gold Coast, Playa Garza and Playa Barco Quebrado have much to offer. In Playa Garza and nearby Playa Barco Quebrado, there are many lots for sale, which are still affordable and perfect for those wanting either to secure a lot now and build later, or build a home that will surely benefit from the increase in travelers and future growth of this area. There are also developments happening in Playa Garza, including but not limited to the Vista Royale, which seeks to provide 18 luxury homes, 24 hour security in a gated community, and gigantic lots with plenty of paradise privacy. Some lots even feature ocean views overlooking the beautiful and wildly popular Playa Guiones. If you just want to come and visit Playa Garza, there is plenty of rental property for you to choose from. The weekly rental rates vary in range, depending on your preferences, but there are beachfront properties, hostels, luxury rentals, and private casitas surrounded by jungle. Be on the lookout for visitors from the rainforest walking or flying by; after all, Costa Rica has some of the most diverse and abundant wildlife on the planet.